Today was amazing. The sun was shining (finally) and campus was buzzing with activity. I can honestly say that it not only affected my spirits, but my over all aura as well. 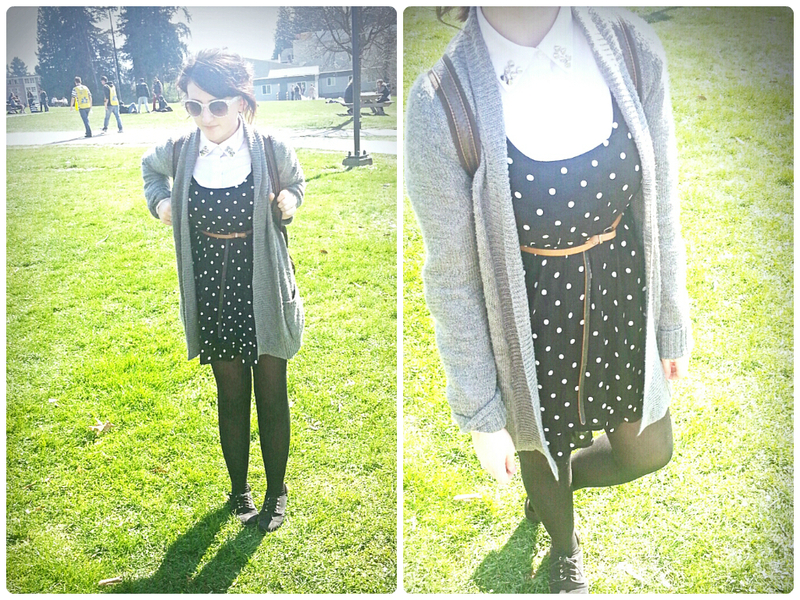 It was a great day to wear something cute and frilly, like this polka dot black mini dress that I chose. It’s quite a low cut piece, so I added some modesty and edge to it by layering a studded white button-up underneath. This was a mistake, I later found out, as I was basically boiling from the inside out. Thank goodness for my university’s AC, or else I would have toasted completely. I could have easily taken of the cardigan, yes, but I wasn’t a fan of how the outfit looked without it. It gave it a more scholarly feel. To play things up though, I put on some funky sunnies that are actually my best friend Maria’s (sorry, Mia. They were in my car). As well, I opted for my favourite backpack that I’ve had since… well, forever ago. Sonia, again, you’re amazing for taking these for me. I cannot ever thank you enough. Plus, our lunch on the green was a blast. Might be doing a shoe unboxing video tomorrow and a vlog from going into the city to do some shopping! Stay tuned!